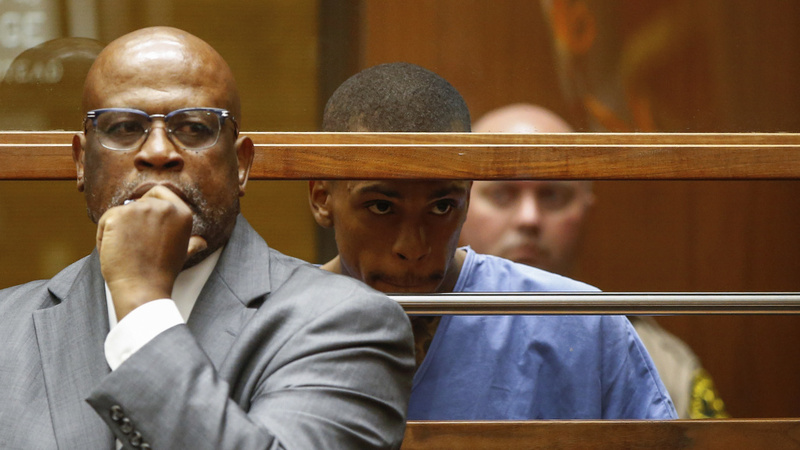 Eric Ronald Holder Jr. (right), 29, who is accused of killing of rapper Nipsey Hussle, appears for arraignment, alongside his Attorney Christopher Darden, left, on April 4, 2019 in Los Angeles. On Thursday, the Los Angeles County District Attorney's Office charged 29-year-old Eric Ronald Holder Jr. with killing Nipsey Hussle, born Ermias Asghedom, on March 31. Holder is also accused of wounding two other men in the incident, which happened outside of a store that the rapper, entrepreneur and philanthropist owned in the Crenshaw neighborhood of South L.A.
Holder pled not guilty to the charges, and was ordered held on $5 million bail. After a widely publicized manhunt, he was arrested on Tuesday in the city of Bellflower, in Los Angeles County. At a press conference held earlier that day, LAPD chief Michel Moore said that police believe that there was some kind of dispute between the two men. According to video evidence and witness statements, Holder allegedly spoke to the rapper, left and then returned with a gun. Holder is being represented by Christopher Darden, who became a household name as a prosecutor in the O.J. Simpson trial in the mid-1990s. Nipsey Hussle, who earned a Grammy nomination in 2018 for his first major-label release, Victory Lap, was 33 years old at the time of the shooting.